The National Human Rights Commission was set up on the 12th October, 1993 under the Protection of Human Rights Act passed by Parliament. The functions and powers of the Commission with regard to promotion and protection of human rights in the country are elucidated in Section – 12, Chapter – III of the PHR Act available on the website of the Commission www.nhrc.nic.in. Besides taking cognizance of the complaints of human rights violations against a public servant and recommending payment of monetary relief to the victim and initiation of punitive action against the guilty government functionary, the Commission is also mandated to promote, research in the field of human rights, spread literacy about them through various means and functions. The faith of the people in its functioning reflects in the increasing number of complaints it has been receiving over the years. The Commission is completing 25 years of its existence on the 12th October, 2018. It would want the people of the country to join the Commission in celebrating the silver jubilee of an institution dedicated to protecting and promoting their rights. 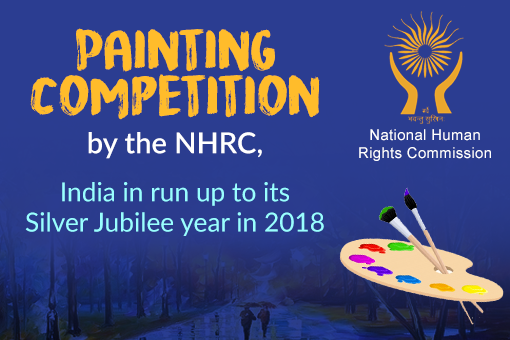 Therefore, as part of a specific note of participation, the Commission requests all the people of the country to participate in the Painting Competition on the theme: ‘My idea of human rights and promotion and protection thereof’ to mark the occasion and participate in this online competition. There will be totally 06 cash awards including Rs. 15,000/-, 10,000/- and 5,000/- for the first, second and third prize respectively and 09 consolation prizes of Rs. 2500/- each along with certificates.